Are you an American author who has written a nonfiction local, regional or national history book and want to get it published? 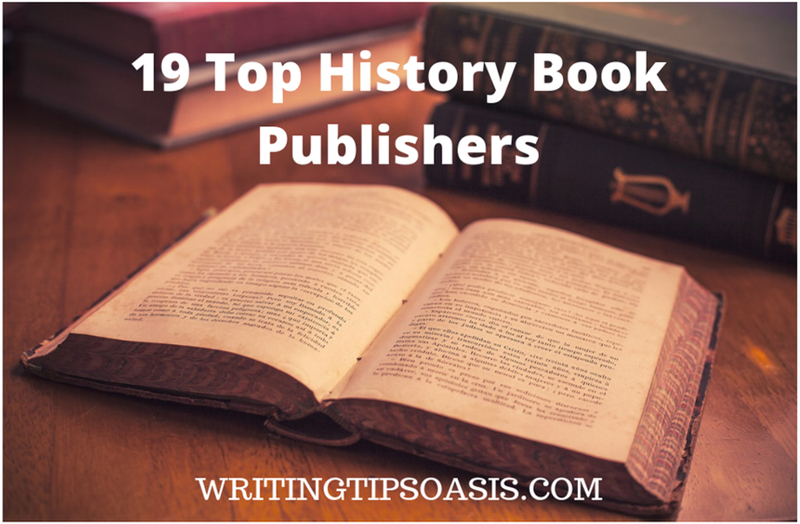 If so, take a look at the following 19 top history book publishers in the United States. One of these might be a great fit for your manuscript. 1. Alan C. Hood & Company, Inc. Established in 1982 in Chambersburg, Pennsylvania, Alan C. Hood & Company, Inc. began publishing books with specific attention and focus on history, rural concerns, and sustainable living. They’ve published books like “Epitaphs to Remember” by Janet Greene and “The True Story of Saint Nicholas” by Rebecca Benson Haskell and illustrated by Elizabeth Durham Goodhue. They are currently seeking submissions for new history books from undiscovered and unrepresented authors with interesting topics for discussion. They recommend that you contact them through their online contact form, found here. Be sure to send an inquiry to begin your correspondence with Alan C. Hood & Company’s editing team to be sure that your book will be a good fit. Based out of Staunton, Virginia, American History Press is an independent publishing company that produces –as one can imagine– books on American history. They’ve produced books like “Women of the American Revolution” by Elizabeth F. Ellet and “Taking the High Ground” by Ted Clarke, a book that recounts the events that took place in Boston leading up to the American Revolution. They are always happy to welcome inquiries from new authors, but they do not accept unsolicited manuscripts. They highly recommend that you send an introductory query letter via email to determine if your book would be a good fit for their roster. They ask that you mention the topic of your history book, your targeted audience, your marketing plans (if any), and briefly mention the sources that you used. With nearly 20 years of publishing experience, Arcadia Publishing has been consistently producing high-quality books out of Charleston, South Carolina. They’ve published historical books like “Lost: Towns of Eastern Michigan” by Alan Naldrett and “Catalina by Air” by Jeannine L. Pedersen. Arcadia Publishing works closely with The History Press (one of their imprints) to help history authors get their books published. They are currently accepting proposals for a wide variety of historical topics about local and regional history. The only thing that they don’t accept are works of fiction or even historical fiction. The best way to get into contact with their editing team is by using their online submissions form, which will ask for your name, contact information, and a bit of information on your book’s subject. Routledge Taylor & Francis Group operates out of Burlington, Vermont. They have published thousands of books and journals over the years, specifically aiming their published works towards academic scholars and instructors. They publish subjects that range from academic research, to classical studies, to history, to women’s and gender studies. They are always ready and looking for new authors to work with and highly recommend that you get in touch with their editorial team. With their established reputation amongst the academic community, far reach in the global market, and peer review capabilities, Routledge Taylor & Francis Group may be an excellent choice for the new history author. For a list of their editorial team’s contact information, click here to get in touch with the right person. Bellevue Literary Press calls New York, New York its home. They are devoted to publishing high-quality literary fiction and nonfiction, with special interest in narratives that begin interdisciplinary discussions. Established in 2007, Bellevue has published several award-winning books and continues to strive towards excellence. Bellevue Literary Press is currently accepting unsolicited submissions via email only. They do not publish poetry, short stories, plays, screenplays, memoirs, or self-help books. In your email, be sure to include a cover letter that offers a description of your work, as well as a brief author bio. For nonfiction history submissions, they ask that you attach your full manuscript for consideration. If you’ve got a history manuscript about the World Wars, consider checking out Basic Books. They specialize in World War I and World War II history books and have published such works as “Sons of Freedom” by Geoffrey Wawro and “Then They Came for Me” by Matthew D Hockenos. Based out of New York, New York, Basic Books is always on the lookout for new submissions. They recommend that you send a query letter first with a bit of information about your manuscript. They ask that you research and get in contact with a specific editor on their team to begin the consideration process. Black Dome Press operates out of Delmar, New York and specializes in publishing history books, especially those that deal with the topics of the colonial era, the French & Indian War, and the Revolutionary War. They ask that you contact them first via their online form with a query letter to see if your book would be a good fit. Blue Bridge is based out of Katonah, New York and has published such books as “Great Books of China” by Frances Wood and “The Gift of Years” by Joan Chittister. As a small, independent publishing company, they receive a lot of submissions from potential authors and will therefore only contact those who have piqued their interest. If you’re interested in submitting to Blue Bridge, they ask that you do so via email only. As an independent publishing company out of Atlanta, Georgia, Clarity Press seeks to produce books that offer objective analyses of social issues both past and present. They publish an assortment of history books, including the recent “Ukraine in the Crossfire” by Chris Kaspar de Ploeg and “The Globalization of Nato” by Mahdi Darius Nazemroaya. They are currently accepting new manuscripts for their history department, but ask that you send a query letter first by email only. They do not accept manuscripts by mail. The editorial team at Clarity Press also ask that you include a resume that details any of your relevant certifications and experiences, as well as a table of contents for your book and an overall synopsis. Eakin Press was founded in 1979 in Woodway, Texas by Edwin M. Eakin. They are primarily interested in local and regional history books, with specific interest in pioneering history and the settlement of western states. They are currently accepting submissions for history books, but are not currently looking for any fiction or children’s titles at this time. Be sure to make use of their online contact form, found here, in order to get in contact with their editorial team. They ask that you provide a brief description of your manuscript, offer a short author bio, as well as the reason why you believe Eakin Press may be the best fit to represent your book on the market. Frederic C. Beil founded his independent publishing company in Savannah, Georgia, in 1982. 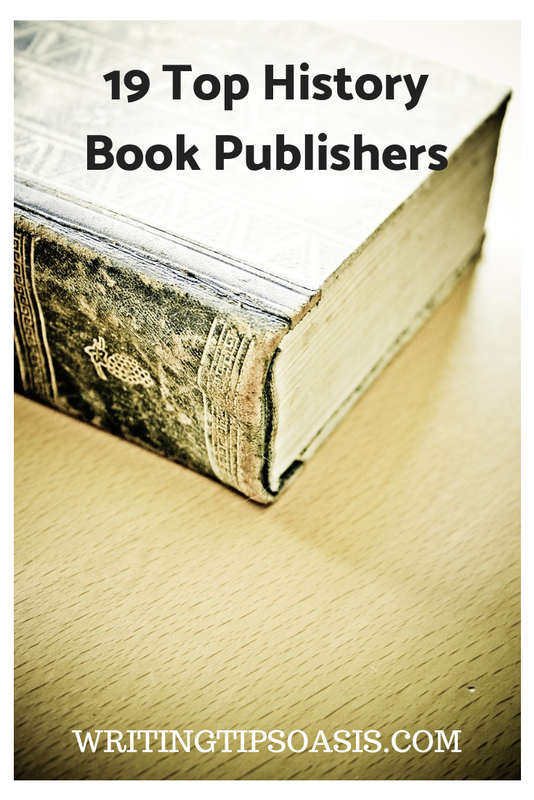 This publishing company continues to produce high-quality and interesting books about a wide range of history topics, publishes biographies, and even fiction. A few upcoming titles include “Saving Madame Bovary: Being Happy With What We Have” by Bruce Fleming and “Aloha: The Surprising Story of an Idea and a Culture” by James Sloan Allen. While this publishing company does accept new submissions, they ask that they not be unsolicited. First send a query letter through the mail, and be sure to include a self-addressed stamped envelope (SASE) in order to receive a reply. For more information on their submission guidelines, feel free to check out their website here. Founded by Kevin Drake in 2011, Gettysburg Publishing is based out of Trumbull, Connecticut. They specialize in history books about the American Civil War, US and world military conflicts. They published books like “Gettysburg Campaign Atlas’ by Phil Laino and “Widow’s Weeds and Weeping Veils” by Bernadette Loeffel-Atkins. While they normally do accept new submissions, they are currently experiencing a high volume of entries and have closed off their submission box for the rest of 2018. However, they will reopen for submissions in January of 2019, so they highly recommend that you check back then if you’re really interested in working with them. For more details, click here. Haymarket Books is based out of Chicago, Illinois. Founded in 2001, their primary goals is to produce and market books that comment and contribute to discussions about social and economic justice. They’ve produced books like “Identifying a Free Society” by Milan Zafirovski and “Women and the American Labor Movement” by Philip S. Foner. They are currently accepting submissions and highly encourage authors to apply if they have manuscripts about progressive and radical political activism. They are not currently accepting fiction or poetry. They ask that you submit your manuscript via email. Be sure to include a cover letter explaining your book’s topic, an outline and summary of your book, a list of currently published books that you believe your book is comparable to, as well as any credentials that you may have that relates to the book’s subject matter. Inheritance Press is an independent publishing company that operates out of Lake Mary, Florida. They specialize in local history, as well as publish personal memoirs. They publish in both trade paperback and ebook forms to better help their authors reach a wider audience. They are currently accepting submissions via mail or email. If you send your submission by mail, they highly recommend that you include an SASE in order to receive a response. They ask that you include a query letter that provides your proposed book title, a brief synopsis, an estimated word count, a brief author bio and at least three sample chapters. For more details about their submission guidelines, feel free to check out their website. Markus Wiener Publisher is based out of Princeton, New Jersey and produces academic and trade books and journals concerning world history, Latin American history, Caribbean history, and Middle Eastern and African history and culture. They also publish books related to music history, religious history, women’s history, Jewish history, general history about western civilization and slavery. They are always on the lookout for new authors and fresh submissions with interesting topics. They ask that you send your submission via email, along with a query letter that details the proposed title of your book, a one-page description of your manuscript, and a short author bio to introduce yourself to their editorial team. For more contact information, click here to be taken to their submissions page. Based out of New York, New York, Other Press is an independent publishing company that publishes books in a wide variety of genres, including history! Some of their most recent publications include “Berlin 1936” by Oliver Hilmes and “At the Existentialist Café: Freedom, Being, and Apricot Cocktails” by Sarah Bakewell. You should submit a query before you send them your submission, as they receive new manuscripts at incredibly high volumes and will only engage with those authors that they’re interested in. You can contact them by either mail or email. For more information on how to format your submission, click here. Located out of Philadelphia, Pennsylvania, Paul Dry Books publishes a wide range of books. Whether it’s classic translations of famous epics or law history, Paul Dry Books seeks to produce only the best. Some of their most recent history book publications include “Ill Met By Moonlight” by W. Stanley Moss and “Lincoln’s Quest for Union” by Charles B. Strozier. If you’re interested in working with this publisher, it’s highly recommended that you get in contact with their editorial team via email or mail. Be sure to explain what your book’s topic is about, provide a brief author bio, and an estimated word count to give their editing team a rough idea of whether or not you’ll be well represented with Paul Dry Books. Santa Monica Press operates out of Solana Beach in California. This independent publishing company ha worked with well-known and talented authors like Jonah Berger, Kevin Brownlow, and Angela Lansbury. Their books have been featured in many media outlets, including Hollywood Reporter, San Francisco Chronicle, The Today Show, and the New York Times. They are currently accepting submissions for history books about any topic. They ask that you include a cover letter that briefly describe your book, provide an estimated word count, and an explanation as to why you believe Santa Monica Press would best represent you. Be sure to include a table of contents, two sample chapters for review, and a list of other books you feel would be comparable to your work. For more information on their submission guidelines, click here. At White Mane Publishing Co., making history fun and learnable for younger audiences is their primary goal. If you’re a history writer who’s written a manuscript geared towards children and young leaners, this publishing company may be a good fit for you. They publish books about the American Civil War, World War II, and more in an engaging and entertaining way to get more kids familiar with important events in history. Based out of Shippensburg, Pennsylvania, White Mane Publishing Co. is currently accepting submissions. Please note that they do not accept unsolicited submissions. Instead, use their online form (found here) to send a query. They’ll ask you for the proposed title of your book, your marketing plan, a sample cover paragraph that you plan to use to draw in a potential reader’s attention, an estimated word count, and your contact information. If they’re interested, they’ll definitely reach out to you to get the publishing process rolling! Do you know any another history book publishers in the United States? Please tell us about them in the comments box below!